How was your experience with us? We hope we have exceeded your expectations, as we always strive to do with our valued clients! If you are one of our happy clients just like the rest (yes, we have a 99% relationship success rate! ), we would love to hear from you. We hope you enjoyed doing business with us as much as we did! Kim assisted me with the sale of a difficult property - difficult in that I was having trouble finding the right buyer. I hired Kim and her team, and within 7 days I was under contract at a price that was fair! Kim was communicative and gave great guidance on navigating through to settlement. She and her team were there for me every step of the way and for that I am extremely grateful. I'd absolutely recommend Kim Barber to anyone in need of exceptional real estate expertise and service. Kim Barber is the most knowledgeable, understanding, and patient agent I have ever worked with. She helped me find the perfect home for me and my family. She is now and ever will be my real-estate agent. "I was juggling both selling and buying my home and I needed an expert who had done this many times before. There were complexities and problems on both selling and buying deals and I wanted a Realtor with hundreds of deals under her belt. I was also out of the country during part of the process and I needed someone I could trust with the big financial decisions. Kim and team targeted the area I wanted to live in and found the right home for me. I chose Kim Barber and team; and I know I made the right decision." Kim brings a lot of energy to helping you find your next house. If you are looking to buy or sell your house Kim would give you great results, easy to work with and very trustworthy. Kim took her time with me and my wife when we have used her in the past. Thanks for your hard work Kim!!! After several months familiarizing ourselves, on our own, with the homes in the area we are interested in, we hired Kim to find us a new home and sell our existing one. Within 3 days, her team found us the perfect home, which was priced way below what we thought we'd have to pay, based on our research. She got us in to see the home the day before it was due to go on the market, and because of our prior research, we were comfortable making an offer that night, which was accepted before the first open house. Kim gave us invaluable advice on fixing up and pricing our existing home, found a buyer in fairly short order, and worked very hard with our buyer to make the transaction work for both sides. Kim (and her team) did all of the above while maintaining a pleasant yet professional demeanor, which we credit as essential in making the whole experience a success. In sum, I'd use her again in a heartbeat. "Kim Barber and her team are Awesome!!! From the initial meeting with Kim to closing everything was honest, accurate, and professional. [We] highly recommend Kim to anyone buying or selling a home in the Northern Virginia/ DC region and would call her in a heartbeat if [we] ever moved back!" Kim, Christine and Dale were fantastic. From the initial meeting to the final closing, they were enthusiastic, responsive and helpful. They helped me with every step of the buying process, kept me informed of what to expect, answered all my questions and went out of their way to make sure I was comfortable with the entire process. The entire process initially seemed overwhelming to me and they could not have made it any easier. I highly recommend using them. Kim was very professional and responsive during the entire process. She listened to our needs regarding selling our home and was able to negotiate a great offer within days of it being listed. Kim and her team did a fantastic job! "I will highly recommend the Kim Barber Group to my friends and colleagues looking for real estate in the Northern Virginia area! I found Dale Brundage to be a very respectable real estate agent that listened to all my housing concerns and wanted to help me find the best house suited for me and not just out to make a sale. Being a first time home buyer the process seemed less daunting and stressful then I had anticipated thanks to the Kim Barber Group." Kim’s team did an awesome job helping my husband and I find a home. They made everything a breeze and even recommended a great lender for my FHA Loan. They encouraged us throughout the search, even when we were losing hope with the current market. We didn’t have to just settle for a home, we found ‘the one’! Thanks Barber Group! Kim worked with me on both the purchase and sale of my home. Both times she has been nothing short of stellar, going above and beyond expectations. Her dedication, professionalism and guidance made for a smooth process on both occasions. She actively listened to my goals, gave sound advice and made me feel like her only client. She’s not only a great realtor, but also a great person, genuine and friendly. I will continue to recommend Kim to anyone and I hope to use her services again in the future. We needed both a Realtor and Property Manager to rent and manage our VA home while we live abroad for a few years. Kim and her team were absolutely fantastic! They took care of everything from hiring a contractor to paint and do a few other repairs (cut and replace tile to install a new dishwasher) to having the house completely cleaned and rental ready. Within two weeks, they found a highly qualified family to rent our house at the high end of our rental range. We would highly recommend them and most certainly will use them in the future for our real estate needs. "When I decided to sell my home, I decided to research potential real estate teams. Customer reviews were very high for the Barber group which prompted a face to face discussion with Kim. I was immediately impressed with her professionalism and proposed marketing plan for the sale of my home. Kim and Christine were in constant contact with me and provided continuous reports on sales in my neighborhood which helped me make informed decisions. I am very grateful for the friendly, courteous service and I highly recommend the Kim Barber group for your real estate needs." "I highly recommend using Kim Barber as an agent to sell your home. She is professional, knows the market, and closes deals quickly. My house sold in just over a month while similar homes in the neighborhood are still on the market today. Kim, Christine, and Dale were a pleasure to work with from beginning to end!" I have worked with Kim and her team two times, first to buy my property and the second to rent it out a few years later. Every time they have been responsive, honest, professional, and FAST!!! I have tried dealing with numerous agents throughout the area and most of them (not all) have been lazy and don’t want to work. However Kim and her team work hard whether its a $1,000 rental or a $1,000,000 sale. I would recommend anyone and everyone to work with Kim and her team, and I will be back when I’m ready to get my next property. Kim is very knowledgeable in her field and made me feel very comfortable with her recommendations for my property. Kim is always increasing her abilities by keeping up with the industry through training and seminars. I would recommend her to anyone and look forward to using her services in the future. "Kim and the Barber Team were great to work with. 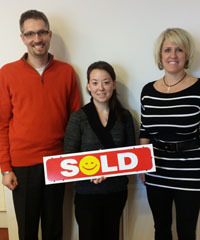 Kim worked with us over a period of 3 months to buy our current home and sell out last home. This was in the Summer of 2012 when the market was no where as good as it is today. Kim took the time to understand our needs, gave us wonderful advice, was an excellent negotiator, and was with us through the entire process. She was accessible when we needed her, and was patient with us when we would reached out to here even during evenings and weekends!!" "I had a terrific experience with Kim Barber’s team, most notably Christine Zubal and Dale Brundage, who were very attentive and helpful, and patient through the entire process. A truly professional and top-notch team, I would not hesitate to work with them again. I will definitely recommend them to friends who are looking at buying or selling a home. Kim is my favorite Realtor. She always has my back and makes sure everything I need is handled. During my sale, and for all the years since. I refer all my clients to her and she'll be my agent forever! Thank you so much for all your help with my home purchase. It went smoother than I could have hoped for, and I'm certain I can attribute that to you. Thank you very much.Thank you for going above and beyond our expectations. Kim and her team worked hard to make sure we had the exposure we needed. On some days we had as many as 5 showings which is great in a slow market. Once we received an offer, Kim worked hard to negotiate all terms that best met our needs. "Kim helped us find our first home and helped us through the entire process as first time home buyers.We were so happy with her service we used her 5 years later to sell our home and buy our next. You won’t be disappointed." I highly recommend Kim Barber for any of your realtor needs. As a matter of fact, I recommended her to my best friend (which I would never do if I didn't have full confidence in her), and recently found out that his house is already under contract for above his listing price. I consider myself a very research oriented, analytical person and after screening a number of realtors in the Northern VA area, I decide to list my home with Kim as I felt she was the most trustworthy, had an exceptional plan to include a marketing strategy I was impressed by, and a high level business acumen that I found vital to negotiating the best deal for me. She, and her team (Christine and Dale), delivered on all accounts validating my decision to choose her. Kim laid out a detailed plan from start to finish outlining each stage of the process beginning with the critical step of choosing a listing price that isn't too high or too low. Kim nailed it. Next was the marketing. Kim hired a professional photographer and put together my MLS listing that looked simply stunning! She listed the property as a “featured” listing on Zillow, Trulia, and other online real estate websites. Within four days I had 6 offers. I was absolutely thrilled. Kim explained her strategy moving forward, with these offers, and in less than a week from listing, she came back to me with an offer that was more than $15,000 above my listing price. I was quickly under contract, and from that point until closing, Kim, Christine, and Dale were constantly communicating with me to make certain the process would continue to move forward without a hitch...which it did. My home was sold very quickly, seamlessly, and at a price I was extremely happy. I couldn't have asked for anything better. Kim Barber and her Team are absolutely amazing! Due to my husband’s job promotion we found ourselves needing to move from AZ to VA and have needed to do so much planning from our computers regarding this long-distance move. Kim and her team have been there for us every step of the way making this transition fairly seamless. The time spent communicating our situation, family’s needs and desires was well received and reciprocated. We were fortunate enough to have a short weekend to spend physically house hunting in VA and Kim came through for us in ways we never would have imagined. I can’t recommend this group highly enough! If they can handle an out of state move this well, I am certain they can far exceed all other realtors with a simple in state move. Kim and her team are highly knowledgeable on the whole process from start to finish. They helped with both the sale of our old house and the purchase of a new house. While the whole process is somewhat stressful, the team made sure we felt comfortable with every step. They also have many ties to the area and were able to recommend vetted services for the work we needed on the new and old house. Kim also knows the area well as she grew up in this area and also does her research with the counties to know about new roads/metros/developments etc that are very helpful when trying to pick a new area to move to. We would definitely use her again! Kim went above and beyond during our experience in buying and selling a home. Can’t thank her enough for guiding us through each step of the process. Her expertise and enthusiasm shine as she truly loves what she does. Kim was the utmost professional. Kim will always be our go-to agent. Kim and her team are fantastic! She knows exactly how to tackle the market. In just a few months of looking, we are moving into our dream home! If you are looking to purchase within the Northern Virginia region, I highly recommend you contact Kim Barber. She has exceptional knowledge and experience within the area and will provide you with information you can trust. Another great aspect of working with Kim is her use of a team. She has great group of people who really work hard to make the home buying process look easy. Kim Barber represented my husband and I on a property that we wanted to purchase. We feel it is the best house purchase we have made throughout our several relocations. She is very knowledgeable about the market and house pricing. She listened well to understand our needs and then effectively matched our needs to available property. Then, she successfully negotiated a contract within our pricing criteria. We highly recommend Kim. Kim is a great local agent that has expertise with short sales. She has a great team of professionals that are excellent to work with and I would highly recommend the Barber Group to anyone looking to buy or sell in Northern Virginia. Kim and her Team are AMAZING. Professional and proactive from day one. They know the Northern Virginia and DC area extremely well. 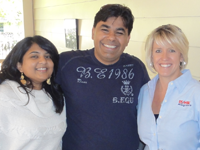 I initially listed a home for sale with Kim and they were able to be find me a home to purchase. The whole process of selling and buying a new house at the same time can be overwhelming but Big Thanks to Kim and her team, I was always informed and they always made me feel like I was in charge. Simply AWESOME! Thank you so MUCH!!! !